Understanding and analyzing fish behaviour is a fundamental task for biologists that study marine ecosystems because the changes in animal behaviour reflect environmental conditions such as pollution and climate change. To support investigators in addressing these complex questions, underwater cameras have been recently used. They can continuously monitor marine life while having almost no influence on the environment under observation, which is not the case with observations made by divers for instance. However, the huge quantity of recorded data make the manual video analysis practically impossible. Thus machine vision approaches are needed to distill the information to be investigated. In this paper, we propose an automatic event detection system able to identify solitary and pairing behaviours of the most common fish species of the Taiwanese coral reef. 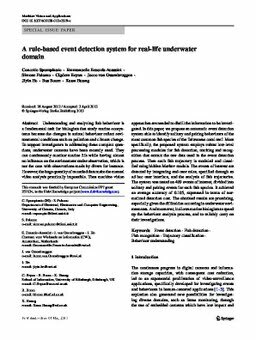 More specifically, the proposed system employs robust low-level processing modules for fish detection, tracking and recognition that extract the raw data used in the event detection process. Then each fish trajectory is modeled and classified using hidden Markov models. The events of interest are detected by integrating end-user rules, specified through an ad hoc user interface, and the analysis of fish trajectories. The system was tested on 499 events of interest, divided into solitary and pairing events for each fish species. It achieved an average accuracy of 0.105, expressed in terms of normalized detection cost. The obtained results are promising, especially given the difficulties occurring in underwater environments. And moreover, it allows marine biologists to speed up the behaviour analysis process, and to reliably carry on their investigations.